Whether for a warrior identifying friend from enemy, a nationalist wanting to represent their views, or a G.A.A. supporter flying their county’s colors, flags have played an important part throughout Ireland’s history. 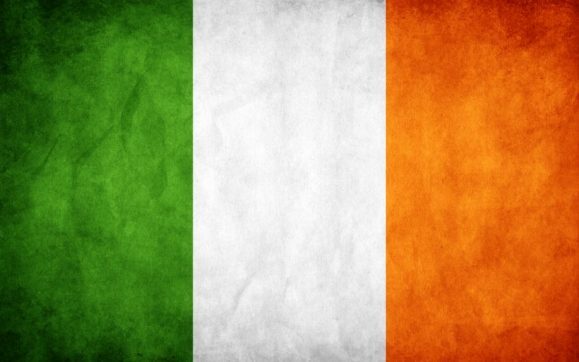 As we celebrate Flag Day here in the United States, let’s take a look back at the flags that have represented Ireland over the years. 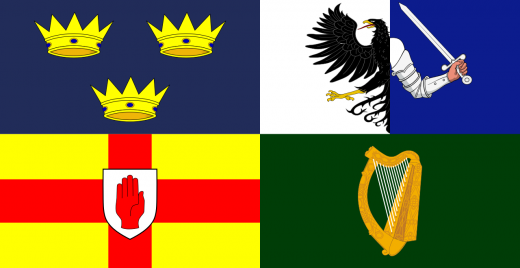 Some of the earliest references to flags in Ireland are representations of the heraldic devices that the kings of Ireland and their families used. Known today as provinces, the major overkingdoms, or cóiceda in Old Irish were; Ulaid (Ulster), Connacht, Laighin (Leinster), Mumhan (Munster), and Mide (Meath). The flag of Munster is represented by three crowns on a blue field. The three crowns most likely represent the three major ruling families: the O’Briens, the Butlers, and the Fitzgeralds in Munster and their respective kingdoms, Thomond, Ormond, and Desmond. The flag of Connacht is the most unusual representation here, as it most likely originates in Germany. The eagle and armed hand is thought to derive from an Irish monastery in Regensburg in Bavaria, as it is shown in an obituary there for the last High King of Ireland, Ruaidhrí Ó Conchobhair. The flag of Ulster combines the right red hand, symbol of the ancient O’Neill dynasty, who were rulers over Ulster, with the red cross with the yellow background, the sign of the Hiberno-Norman family the Burkes, who held the title Earl of Ulster in the 1240s. The fourth flag is one of the most recognizable symbols and is largely the basis for most Irish symbols today, Leinster’s gold harp on a green field. The oldest and probably the first recorded use of the harp on a green field as a flag was by Eoghan Ruadh Ó Neill. After the defeat of his uncle, Aodh, Earl of Tyrone, at the Battle of Kinsale in 1601, Eoghan used this as a war flag during the Irish Confederate Wars in the 1640s. Unfortunately Eoghan was killed in 1649 but his standard lived on to represent Ireland on a massive scale – and not just in Ireland. Over the the next century, there were variations of Ó Neill’s harp and the green field. The United Irishmen used it throughout the 1798 and 1803 rebellions, but it wouldn’t been seen again until the American Civil War. However, in the 1830s, a new flag was rising. 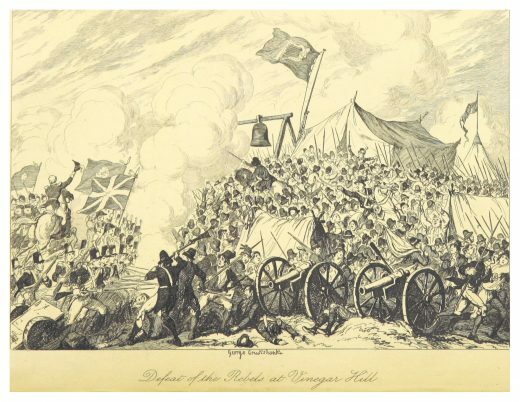 The flag featured at the Battle at Vinegar Hill. Artist: George Cruikshank (1792–1878). Accession number: British Library HMNTS 809.k.6. 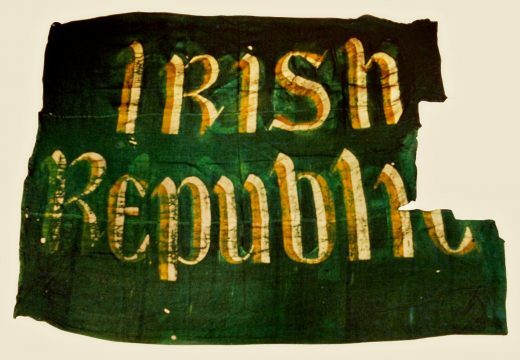 After the French Revolution, Irish Republicans began to develop a tricolor of their own. Throughout the 1830s and 40s tricolors were popping up throughout Ireland but were not widely recognized until Thomas Francis Meagher, a leader of the Young Irelanders Republican group hung a tricolor of green, white and orange with a red hand in the middle on the headquarters of the Wolfe Tone Confederate Club in Waterford. 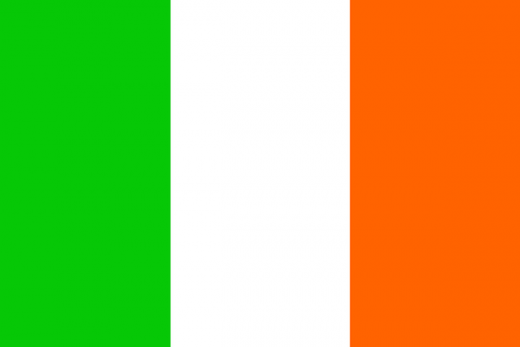 The significance for these colors were massive as they represented the whole of Ireland. Green for Catholics, orange for Protestant, and white for a “lasting truce between Orange and Green,” according to Meagher. Meagher is also connected with another Irish flag, the flag of the Irish brigades in the American Civil War in which he served as a Brigadier General. 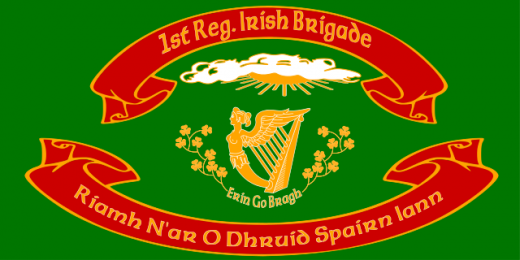 1st Regiment Irish Brigade Flag. While the tricolor became popular after Meagher and the Young Irelanders’ efforts, it still wasn’t recognized as a national flag but the momentum for its national status began nearly 70 years later in 1916. During the 1916 Easter Rising, three flags played important parts.While the executive council was originally going to place the flag of Eoghan Ó Neill, the night before, James Connolly presented the tricolor as the option instead. Meagher’s flag was going to be put on center stage, the General Post Office alongside a flag proclaiming the Irish Republic. 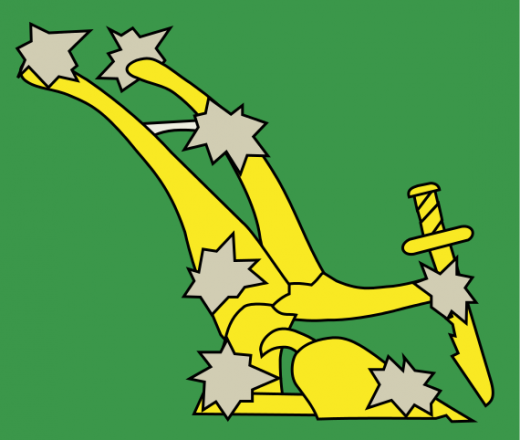 The third flag, depicting the constellation Ursa Major, also known as the plough for Connolly’s Irish Citizens Army, was placed at the Imperial Hotel on the day as well.